A perfect New Years Eve party is the matter of joy for the whole yea, but it is not a piece of cake to arrange a perfect party and to do so you have to do a great deal of hard work and study so that your friends and relatives will talked about the party for whole year. Read our suggestions on How to organize a New Year party at home which will be helpful to throw the most spectacular New Years Eve party that you can be proud of. Make the guests list: A good party not only need a good host but the guests who are invited in the party are also counted. Make your guest list according to the place your have means size of your house and the rooms in your home which you are going to use for the party. So invite the number of guests which will fit comfortably in the space you have for activities such as eating, dancing as well as socializing. Invitation for New Year party: Invitation plays an important role for any party, so send the invitation to your guests in advance so that you they can make their plans according to that because all people have their own plans for New Year. To send the New Year party invitation you can send email or use other social networking sites or through cell phones. You can also send handmade invitation also to add personal touch and care. Do not forget to mention the New Year party theme or dress code if any so that your guest will dress according to that. New Year Party theme: It is good to throw theme based party as it will be easy to plan and you can make arrangement according to theme. Themes helps to organize the party, plan your color scheme and the set the overall mood for the event. There are lots of New Year theme like peacock fantasy theme, Masquerade Party, Mystic Party, Poker Night party, Glow in the Dark Party and so on, you can choose any theme you like. 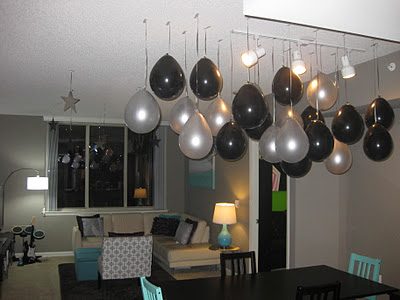 New year party decoration: If you select any theme for your party than get your decorations according to it. You can buy some fun things like noisemakers or blowouts and New Year's party hats to make the event more happening. Do not forget to decorate the special areas of your home like entrance, staircase, living area dinner table and so on. Food menu for New year party: No party is complete without good food and when it comes to New year party then how can we forget the food. Select the food which is easy to cook and handy as well. Mix all kind of Roasted nuts such as peanuts, almonds, cashew, pecans etc. in a bowl for everybody to nibble on. Prepare some finger food like baked potatoes, paneer tikka, cheese bites, spring rolls, baked vegetables, mushroom fitters and so on as an appetizer which can be reheat easily. Now it's time for the main courses choose the recipes which do not need much preparation go for simple recipes which can be served easily such as fish cakes, Mexican veggie wraps, Risotto, Burgers with Roasted Tomatoes and so on. Set up a buffet-style table so guests can serve themselves throughout the evening. Last but not the least does not forget the dessert a carrot or dry fruit cake, Peanut Butter Pie, Chocolate orange rum balls are the perfect choice for the event. Drinks for New year party: Drinks are must for every party and to celebrate New year eve Champagne punch is always a hit and easy to serve. You can choose any cocktail recipe you like for New Year but do not forget to store lots of beer and wine. Have some non-alcoholic drinks (mocktails) options for the teetotalers and kids so that they can feel the heat of the party. Party favors plays an important role to keep the memories alive, so send your guests with some unique party favors. Make a CD of your favorite's songs from 2012 and gift them to your guests, get beautiful photo frames from the market or make it yourself paste some beautiful pictures, handmade ornaments, wind chime or any other useful gift as a token of good wishes. -	Music is the lifeline of any party, no party is complete without good music, select the music for your party carefully, include some romantic dance numbers so that the couples can enjoy dancing together, get some popular party dance numbers for teens and some playful songs for kids. Also select some instrumental music or any other soft music which you can play when your guests are not in a mood to dance. -	Games: There are lots of party games which can be enjoyed by your guests. Games that involve dancing are popular on New Year's Eve. There are many other party games such as Bouncing Ball Drinking Game, Two Truths and A Lie, Guess the Resolution, Pass the card and so on. -	Competitions and prizes: Arrange some competitions for kids and adults like paper folding, who can eat more, treasure hunt and so. Do not forget to distribute prices as token of appreciation not only to the winners but also for participation. We hope all above suggestions will help you to organize a rocking party which your friends will never forget and wait eagerly for the next New Year party to get some more surprises.